"There's something like 45 little variations or snippets or visions that run through the CD. So if there was ever an amazing roll out of tapas, every possible different kind of dish, but just a bite of each, that would be what's going on in the CD overall. And we thought that would be an amazing challenge to keep all of those different dishes hot at the same time." That's violist Sarah Darling sharing the secret recipe behind, Visions and Variations, the latest recording from the Boston-based string ensemble, A Far Cry. 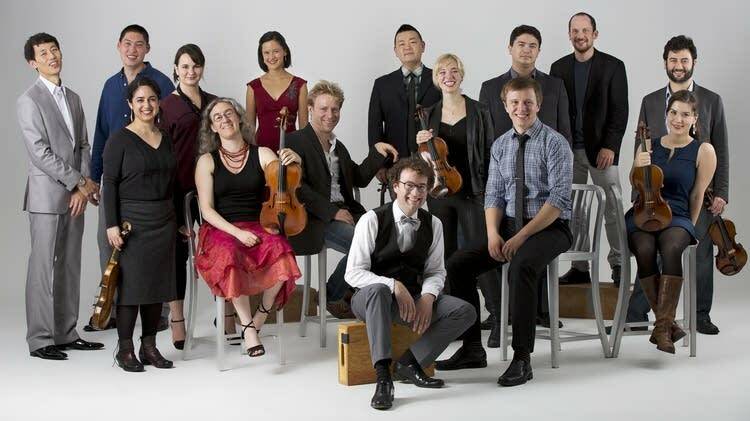 Violinist Jesse Irons says the name of the group is somewhat tongue-in-cheek. "Certainly, there's the surface meaning of the phrase 'A Far Cry from …'  who knows? And there was the sense from the beginning that we wanted to do something a little bit differently. The musicians were coming together to do something for themselves in a way that felt very authentic and personal. "People commonly remark that it's striking to watch us perform. One of the things we discovered about 10 minutes into our first rehearsal 11, 12 years ago was that we sound a lot better when we're standing up. So we have no chairs except for the cellists. It's almost kind of a dance that happens on stage." "We've been compared to a flock of birds," Darling adds. "And for every piece that we perform, the leadership model changes just slightly. In other words, we're always empowering each other to take on sometimes very hefty leadership roles. And when person X is driving the boats, the rest of us are enthusiastically paddling." Let's dive into your latest journey, which is a recording called Visions and Variations, which opens up with Britten's Variations on a Theme by Frank Bridge, who was his teacher. Why is this work a good fit for the criers? "This is a piece that we love performing," says Darling. "I think for us, being able to turn on a dime, being able to sort of be in each other's shoes and push each other to really experience these kind of artistic extremes that's just  you know, you start playing the Britten and you feel like the composer is right there with you, challenging you to give the best and the most complicated music that you got in you." There is a world premiere on this recording. It was created by another violinist in your ensemble, Ethan Wood. What a wonderful new life that Ethan brings to this familiar melody by Mozart. "It's defined as a folk tale that features characters created by Mozart. And every single person in the ensemble has their own unique part. And with that in mind it's a fiendishly difficult piece to rehearse. And I think that part of where Ethan got the crazy idea from is he's been living a really interesting life doing a lot of improv comedy. All of which is to say  we get this piece, and our socks are blown off." The recording closes out with Prokofiev's Visions Fugitives, which originally was a set of character sketches which were just 15 visions, and you've added five additional visions arranged by the Criers  so the recording has all 20 variations on it. "We actually, in the course of rehearsing this piece, assigned all of the variations to individual criers that were playing in the orchestra," Irons explains. "It might be that one of the variations really perfectly fits one of the players. But it also works equally well to pair a variation with a musician in an unexpected way, because then you go, 'Oh! There's a layer in there that perhaps we don't know about.' We had some fun with it." To hear more about A Far Cry's new recording, Visions and Variations, click on the extended interview above, or download the extended podcast on iTunes or wherever you get your podcasts.